By the London Bridge and Brooklyn Bridge, The big drills popped out from the ground on May, 21. 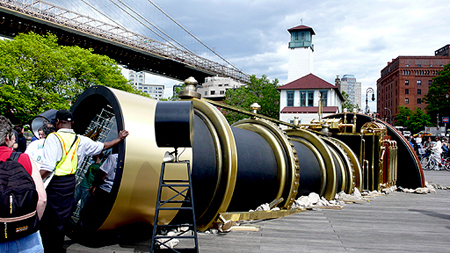 Next day an extraordinary optical device called a Telectroscope appeared on the sites that is connecting from London to New York through the tunnel. You can link up with people in London from Brooklyn thru the Telectroscopeã€œâ™ª The idea of the Telectroscope seemed too outlandish to be possible and yet there was something in the scribbled notes that had the ring of truth about it. Despite the many gaps and inconsistencies, Paul St George began to piece together his ancestorâ€™s remarkable storyâ€¦ It will be up til June, 15.